In recent weeks the theme of suicide bombing has begun to acquire a new resonance in the North Caucasus. The story of the miraculously "resurrected" Alexander Tikhomirov (aka Said Abu Saad, plus the not entirely obvious nickname "Buryatsky" [the Buryat]), the recent statements by Caucasus Emirate leader Dokka Umarov and the predictions of Russia’s siloviki (“people of force”) are painting a new vision of the North Caucasus. The tactic of istishhad (heroic suicide aimed at destroying enemies, and accepted by some Islamic scholars as an act of martyrdom) is perceived by public opinion in non-Muslim countries as deriving from the teachings of Islam. However, its source cannot really be found among the core elements of Muslim tradition. It is worth noting that among Islamic theologians (both Shiite and Sunni) there is no unanimity as to whether suicide bombers should be treated as shahids (martyrs) or as common suicides. While to an outside observer the suicidal nature of such actions is obvious, an Islamic theologian’s religious and political orientation is usually determined by his attitude to istishhad. The widespread practice of heroic suicide, which is close to the modern concept of terrorism, has historically been associated with the various currents of Shiite Islam. In most cases, the targets of such attacks have been Sunnis, whom many Shiite Muslims still consider to be "infidels". The first widespread use of istishhad was practiced by the Ismaili Nizarites, most of whose victims were Sunnis. But it should be noted that the practice of heroic suicide was not a part of Nizarite teaching. Other movements within Persian Ismailism resorted to terror-based methods of combat, and the Nizarites merely borrowed their experience and applied it on a large scale. It is hard to say whether there is any truth in the legends about the Nizarite leaders’ use of hashish to drug their fighters. There can, however, be little doubt that the Nizarites did resort to deception in order to motivate their terror-practicing followers: the movement’s rank and file members were motivated by a desire to attain the Muslim paradise as soon as possible. Being uninitiated, they could not know that the esoteric teachings of the Nizarites viewed paradise exclusively as an allegory of "perfect knowledge" involving experiences that were purely spiritual. In modern times the revival of istishhad has largely been due to the efforts of the followers of Shiite Islam – more specifically, Shia Imamites. Accordingly, the first victims of their suicide attacks were their Sunni co-religionists. 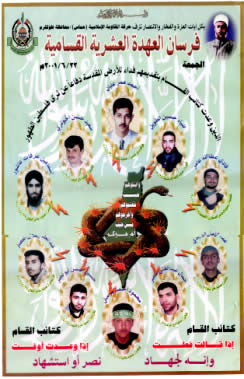 After the conclusion of the Iran-Iraq War of 1980-1988, a cult of shahids formed in Iran – the martyrs’ portraits still adorn the walls of Iranian apartment buildings and the banknotes issued by the Central Bank of Iran, and it is seldom that a statement by a political or religious leader omits reference to the memory of the heroes of the “Holy Defence” (the Iran-Iraq War’s official name). Even Iranian exiles - both Muslims and agnostics, and even recently converted Zoroastrians and Iranian Jews who are generally critical of the Islamic Republic – speak with great respect for the war heroes who voluntarily gave their lives. One can only guess why the North Caucasus Islamic resistance has been compelled to revert to the tactic of istishhad. One theory has it that the influx of volunteers often boasted of by the leaders of the Caucasus Emirate has coincided with a severe lack of resources (food and weapons). As a result, the leaders of the resistance think it proper to compensate for their material difficulties by a demonstration of courage to their enemies. Whatever the truth of the matter, through the efforts of the new figures in the leadership of the North Caucasus resistance, the region is fast becoming an additional front in the global confrontation between radical Islam and Euro-Atlantic civilization. One of the principal elements of that confrontation has long been the tactic of istishhad. Picture: "The Intelligence and Terrorism Information Center".